All you have to do is to choose the item you decide to buy and assemble. That’s it! We pick the furniture or household item you choose directly from the shop. We bring the item to your home. No worries for carrying companies! If you don't have the tools or time, we can assemble the item at your house. 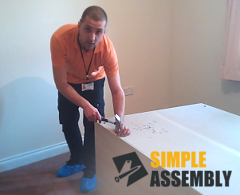 Do you need a hand with your flat pack furniture assembly in Winchmore Hill N21? Then, you can count on the professionals from Simple Assembly to complete the task for you. The technicians have years of experience in assembling furniture from most popular brands. This means that they are familiar with theassembly instructions for a wide range of different types of furniture from various retailers. Therefore, we always deliver our service in an efficient manner and up to the highest standard, whether it is an IKEA wardrobe, a bed from Argos or a Mamas & Papas cot. Our company has build and outstanding reputation over the years. Many customers have said to prefer us before other assembly providers for the affordable prices and individual approach. We realise no two furniture are exactly the same and will bring along a selection of tools to be able to provide you with great looking bed, table or other furniture. With out flat pack assembly services you will receive a prefect balance of great results and rock-bottom prices. Additionally, our company specialises in furniture collection and delivery services from IKEA. So, you can schedule your flat pack furniture assembly together with having the pieces delivered to your doorstep by us and save money in the process. Also, for your convenience, we offer a round-the-clock customer support, so whenever you need to speak to one of our friendly advisors, just give us a call or use the live chat option on this website. For less urgent matters, you can get in touch via the online contact form. Our flat pack assembly services offer a number of addition benefits you will enjoy, when making a booking with us. For quick and easy booking on Winchmore Hill N21 assembly services call 020 3404 5905 now! We have a team of friendly call centre operators expecting your call around the clock to help you define the right service for your needs and to offer you free quotes. And for those of you who'd rather get in touch and make bookings online, use our live chat or online booking form. The nearest tube station serving N21 Winchmore Hill is Southgate.